One of the things I love about summer is the low effort cooking. When it’s hot I don’t want to eat a whole lot, but I like to pick at the odd dish. Potato salad is an ideal “pick-at” kinda thing. You can have it as a side or as a light lunch, and because of the meaty twist with the bacon, you can definitely eat it as is. If you wanted a slightly heartier meal I recommend a nice grilled steak with this. You could also substitute the mayonnaise for a very simple olive oil, salt, freshly ground black pepper and lemon juice vinaigrette – in that case dress the potatoes when still warm as they’ll really soak up all the flavours that way. 1. Scrub and place the potatoes in a pan with cold water. Bring to the boil, salt the water and cover. When cooked (about ten minutes or so) drain and run cold water over them to stop them from cooking. Slice any particularly large ones into bite-sized pieces and set aside. 2. Put the butter in another pan, add one onion and the bacon and sautee. 3. Chop the boiled eggs into chunks and combine the cooked onion and bacon, raw onion, gherkins, potatoes and eggs in a bowl. 4. Add the mayonnaise and mix until everything is well-coated, season with black pepper and a little salt (not too much because the bacon is a little salty). Let chill in the fridge until ready to eat. 5. Serve as a side dish or eat straight out of the bowl with your fingers, smearing mayonnaise and egg all over your face. Oh wait, is that just me? I’ve got another recipe I’m making later this evening, so I’ll post about that soon (depending on if it’s a success or not…) so until then, peace and love. I just love potato salad…this would be perfect with a veggie burger! Mhm, you're right! 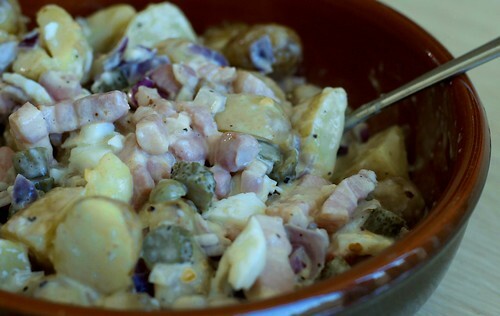 Omit the bacon and you could have a veggie potato salad, too – yummy! I just love potato salad, one of my favorite summer dish!